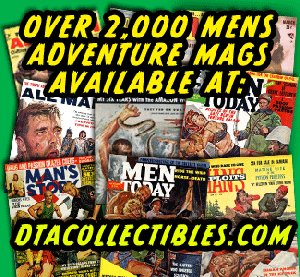 Men's Adventure Magazines: Psycho killer cannibal Albert Fish vs. killer fish. Which is scarier? Psycho killer cannibal Albert Fish vs. killer fish. Which is scarier? 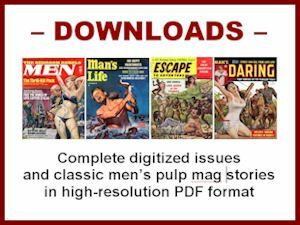 Challenge for Men was a classic men’s adventure magazine published from 1955 to 1959 by Almat Publishing (part of the Pyramid book and magazine publishing group). 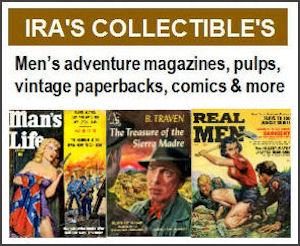 Most issues of Challenge for Men featured excellent action-oriented painted covers and interior art. 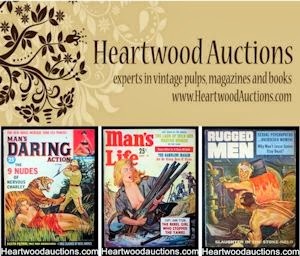 They also included a typical mix of men’s adventure style features: man against creature yarns, war stories, exotic adventure tales, true crime stories, sports and hunting articles and “cheesecake” photo spreads. 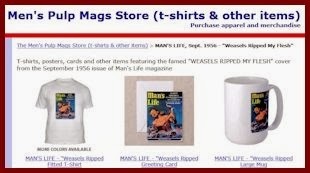 The September 1956 issue of Challenge for Men is especially good (and well worth snagging if you see it on eBay). Even the cheesecake photo spread inside is better than average. In addition, the story about Ekberg that goes with the photos was written by one of America’s great modern humorists, Art Buchwald. His Ekberg piece is titled “The *9 hills of Rome!” — with an asterisk in front of the number nine. In small type next to the asterisk at the bottom of the page is a Buchwald-style pun playing off the notoriety of the famed Seven Hills of Rome and Ekberg’s biggest, er, assets. As a diver, I’ve seen many barracuda. I know they can be dangerous if provoked or if you’re stupidly carrying around a stringer of bloody fish underwater. But most people tend to view barracuda as being more of a threat to humans than they really are. In the article, Charles notes that he dealt with the infamous Fish twice. The first time was in 1931, when Fish was being held for observation at the Bellevue psychiatric unit after sending obscene letters to a young girl. In that case, Fish was ultimately set free, since no physical harm had been done to the girl and there was no other evidence against him at the time. Three years later, Charles interviewed Fish at Bellevue again after police determined that he had kidnapped, murdered and eaten 10-year-old Grace Budd. Fish is definitely the creepiest. In addition to killing at least 15 young kids and attacking scores of others, Fish was also into self mutilation. Makes barracuda seem kinda cute and cuddly by comparison.